Develop a new career path or enhance your existing career! Now that Hypnosis is highly recommended for relieving stress, weight loss and smoking cessation, there is an increased interest in Hypnosis as a career path or in the personal use of Self-Hypnosis. Now is the perfect time to discover how the theory and science behind the Art of Hypnosis is used to facilitate change. Or use the skills to guide your friends, family or clients into the life they want! Use Self-Hypnosis and begin Hypnotizing yourself immediately. Learn techniques to Hypnotize others for desired changes. Develop skills through in-class practice and monitored Hypnosis of volunteers. Grasp the principles of NLP (Neuro-linguistic Programming) in rapport building and reframing to create change. Master Meridian Tapping (Emotional Freedom Technique) to augment Hypnosis or use as a stand-alone practice. Gain Marketing Skills and gather tips on setting up sessions and/or programs for your clients. Use these easy and fun techniques immediately to begin a new rewarding and exciting career! Many doctors, nurses, dentists, social workers, first responders, sales professionals and consultants have added the benefits of hypnosis training to their profession---leading them into even greater success! You can also use your newly acquired skills immediately to get more out of your life and encourage increased cooperation from your family, friends and/or co-workers. You'll become comfortable with your abilities through monitored in-class experience and practice. Classes are intentionally small to give you personal attention with time for questions and feedback. There will also be plenty of time to rehearse techniques. Imagine the incredible value in developing a new skill set or career. After successful course completion you will receive National Guild of Hypnotists Certification. For more information, contact Karen at 312-315-2100. Join this fun and interactive class! 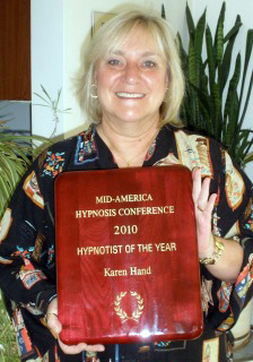 National Guild of Hypnotists, Karen follows the NGH Code of Ethics and Standards of Practice.